“U.S. 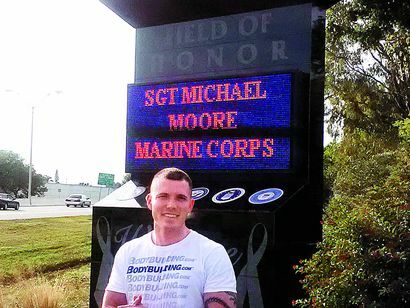 Marine Michael Moore was the 2,300th U.S. serviceman to visit Southwest Florida since 2005,” Operation Open Arms Founder Capt. John “GiddyUp” Bunch said this week. Although Moore’s family now lives in Orlando, Herrin said he does not think of home until he crosses the bridge and looks out and sees Matlacha Pass. “Michael Moore, like the 703 U.S. Marines before him, had a very short list of wishes. Thanks to great OOA partners like the Sandy Hook, Affordable Limo Service of Cape Coral, Paragon Aviation and the Matlacha Hookers, young Moore returned to Russia a very happy U.S. Marine,” Bunch said. “Mike and I have been best friends for just over 16 years, he is one of my heroes and I thank you from the bottom of my heart with treating him like the American hero that he is,” Herrin wrote to Bunch. “This is probably why Operation Open Arms was selected as the first Pine Island charity to be named Best Charitable Organization in Fort Myers for 2011-2012,” he said. © Copyright 2013 Cape Coral Daily Breeze. All rights reserved. This material may not be published, broadcast, rewritten or redistributed.